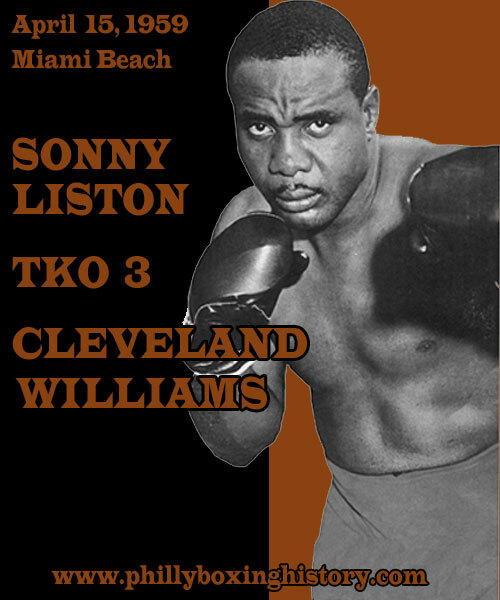 On this day in 1959, Charles "Sonny" Liston started slowly but picked up enough steam to score a third round technical knockout over Cleveland Williams at the Miami Beach Auditorium before a crowd of 2,842. Williams started the fight well, using his jab and some sharp right hands to bloody Liston's nose. But after losing the first session, Sonny started the second session with "hurt" on his mind. He pressed Williams and began to land his infamous bombs. Near the end of the round, Liston staggered his Texan foe with a vicious volley. In round three, it was all Liston. He dropped Williams for a count of eight, who gamely struggled to his feet. However, Liston was ready to show his stuff as a finisher. One deadly combination later, Williams was laid out flat. Although he once again bravely rose from the knockdown, Williams was in no condition to weather any more punishment. Referee Jimmy Peerless jumped in to stop it at 2:04. The pair fought again about one year later with Liston winning even more quickly.